Get access to the SSE Reward presale today here. 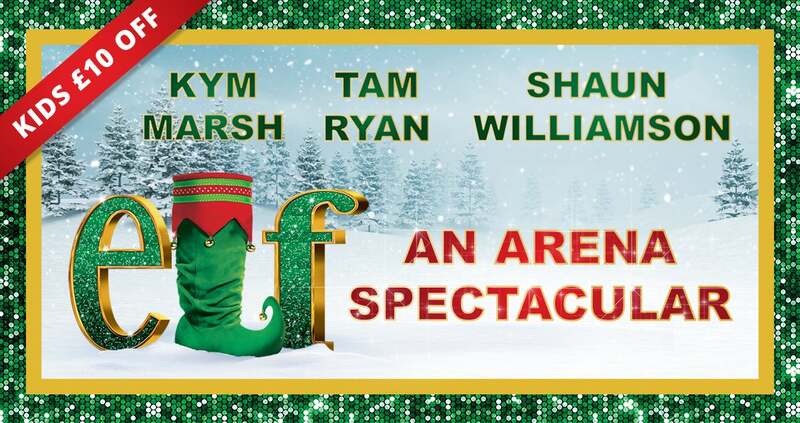 ELF, the Broadway musical based on the hit Will Ferrell movie, is supersized into a huge Arena spectacular this December. It’s the heart-warming story of how human Buddy, raised by Santa’s elves at the North Pole, travels to New York to find his real father, falls in love and brings Christmas happiness to everyone. Starring award-winning Coronation Street actress and singer Kym Marsh as Buddy the Elf’s girlfriend, Jovie, and Shaun Williamson (Barry Evans In EastEnders, Extras) as Buddy’s dad Walter Hobbs. Buddy the Elf will be played by the hilarious comedy actor Tam Ryan, ensuring lots of laughs. The cast also features Father Christmas, and a dozen cirque stars, in a cast of 100. Don’t be a cotton-headed ninny muggins – make sure you get your family tickets now!